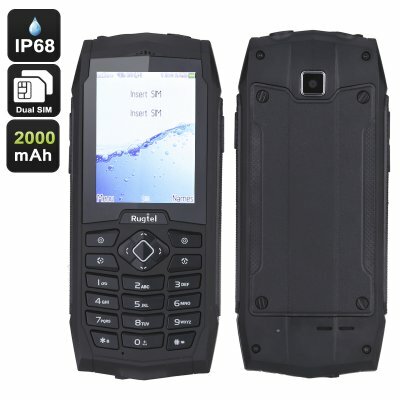 Successfully Added Rugtel R1 Rugged Phone - Dual-SIM, Dual-IMEI, Flashlight, IP68 Waterproof, Dust Proof, Shock Proof, 2000mAh (Black) to your Shopping Cart. The Rugtel R1 is a traditional cell phone that features a fully-rugged design. With its keypad and 2.4 inch display this Chinese phone allows you to enjoy the basic features that every phone has to offer. An IP68 rating makes the Rugtel R1 fully resistant against water, dust, and shocks – allowing you to head out into the wild with your cell phone in your pocket without having to worry about the wellbeing of your electronic device. This extremely durable mobile phone holds a huge 2000mAh battery, providing you with a stunning 48 hours of continuous usage time. Featuring the MTK6276A CPU this rugged phone can smoothly handle whatever you throw at it. Snap pictures, make and receive calls, send messages, listen to music, or browse the web – the Rugtel R1 is a phone that is guaranteed to meet your demands. With its Dual-SIM card slots and two IMEI numbers, this cell phone allows you to be connected to two network providers simultaneously, making it a perfect telephone on which to separate your work and private contacts by using just one device. Additionally, it allows you to be connected to two different 3G network providers at the same time, offering you with a wider connectivity so that, no matter where you’re headed, you will always be able to access the local internet. Equipped with a flashlight at the rear of the device this telephone allows you to light up your surroundings after dark. Additionally, this flashlight allows you to snap pictures and record video in dark areas with the phone’s integrated camera. The possibility to add up to 32GB of external data provides you with enough space to store all your snapped pictures and favorite music that can now be carried along in your pocket where ever you go. The Rugtel R1 comes with a 12 months warranty, brought to you by the leader in rugged phones as well as wholesale electronic gadgets..